I think there is a very great deal of truth in this (I leave aside the category mistake that JMG makes about ‘God’ and gods). Specifically, I see the death of the mainstream churches (in the West) as rooted in a surrender to a scientific spirit which – as part and parcel of that spirit – also rejects any acceptance of magic and (what is commonly called) the supernatural. If the church doesn’t dispense magic – and the most magical elements of Christianity are the sacraments – then it no longer has a spiritual purpose, and JMG’s description is justified. Magic here must be understood in its proper sense, not Harry Potter-esque action at a distance, but rather as the changing of consciousness in accordance with will. In Christian terms it is about the renewing of our minds. How many clergy actually take spiritual warfare seriously in their daily lives? I am only beginning to, and I am aware of how far I have to go in developing this, yet I am very conscious that – most especially from the viewpoint of the institution – I am a bizarre outlier. It’s a marker for how far the scientistic spirit has taken root within the church itself. I am conscious of having written about this in greater depth in my book: “With you is my contention O priest!” I am quite certain that unless we attend to this deep spiritual wound within our common life then everything else we do will be of nothing worth. Which is another way of saying: the first commandment must come first, and because that is laughed at within the church, this is why we die. Something to add to my musings about the Church of England. I do not yet have a solution; but I am working on it. 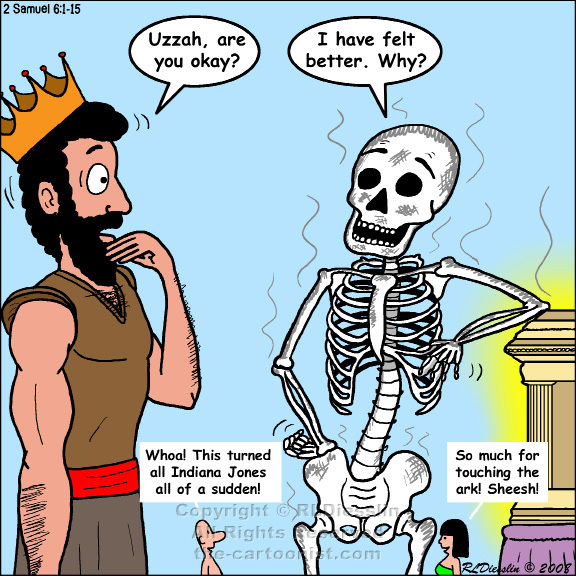 I’ve been writing up something for the PCC about what we consider sacred, and looked back at the story from 2 Samuel 6 about Uzzah – he’s the guy who is struck dead by God for touching the Ark of the Covenant. I wonder – was he simply a really stressed-out guy? In other words, was he just someone nervous, terrified of his responsibility for carrying the ark, incredibly jumpy (totally the wrong sort of person for the job in other words) – who, when disaster struck and the oxen stumble, reacts simply as a human being to steady the Ark – and then realises that he has broken a major taboo and the stress overwhelms him and he drops dead of a heart attack? I ask this because it would seem odd for a God who accepts crucifixion for himself to get that upset about a wooden box. In my last column I talked about the spirituality of anger, looking mainly at anger from the perspective of an individual. This week I want to talk about the more social elements. One of the consequences that often follow from a mistaken suppression of personal anger is that the person concerned becomes depressed. Where anger is a normal and legitimate response to something that has gone wrong, where it is what I call ‘righteous anger’, and where that anger is suppressed for whatever reason then it is common for the person whose emotions are being suppressed to lapse into a depression. It is rather like the way in which zoo animals can become depressed as a result of being taken out of their natural environment. A lion might be as fully fed as they could ever wish, yet if forced to live within a compound that is just a small fraction of the territory that they are adapted to in the wild then the lion simply will not flourish. A vital part of their instinctive nature has been walled off, and a listless anomie can settle upon them. I believe that much human depression is analagous to this. Now let me quickly add that depression is a complex and multi-faceted phenomenon – an overwhelming experience for those who suffer with it, and a controversial source of dispute for those who seek to understand it. I would hold open the possibility that there are non-social reasons for depression, that is, that there may be some cases or forms of depression that are correctly called an illness. I shall pursue the details of that discussion another time. All I need to rely upon for my purposes here is an acceptance that there are some forms of depression which come about as a result of particular events and circumstances in a person’s life. My concern is – when this happens, how do we as a wider community react to that person’s suffering? Do we seek to keep the sufferer silent? After all, there is a long and disturbing history of authorities seeking to silence those who are opposed to the status quo. What happens when the righteous anger of a protester is suppressed? Does the protester then become literally like the lion in a zoo, confined within concrete walls and denied access to our fully human society? Do we mistakenly medicalise the situation? That would seem so much more humane a response than simply locking up someone that makes the establishment feel uncomfortable. Yet as the magnificent ‘One Flew Over the Cuckoo’s Nest’ dramatised, a neutralisation of dissent under the guise of medical therapy can be even crueller than the loss of liberty itself. Or might we start to take the individual seriously, and seek to understand what is happening in their life and relationships? Might we in fact start to treat the individual, not as an isolated atom that can be best understood through isolating them from their fellows, but rather as an integral part of a much larger web of connections? This is the approach taken by, amongst others, family therapists who have long recognised that it is often impossible to heal one member of a family without also engaging with the other family members alongside them. I would wish to broaden out that sensibility to consider the wider society. If a person has become depressed I would argue that there are often particular roots in political and economic factors. For example, if someone has lived and worked as a miner for twenty years, through to their mid-40s, and then as a result of political decision making that pattern of life is removed as a practical possibility for them, it is not surprising if depression follows. The right response to such a situation is not to punish the sufferer for their wrong views but rather to sympathise with their plight and begin to investigate ways of changing their situation – to give the legs of the lion more room to roam. Where does such an analysis end? After all, the extent of social injustice stretches very far. For me, I am forced to draw upon the traditional Christian language of the Fall in order to make any headway at all. The doctrine of the Fall states that we are all born into a sinful world and we cannot help committing more sins as we live within it. In other words, there are no easy answers on which we can depend when faced with the messy reality of human psychological health. There is no neat solution that fixes all things and all people. Yet there remain two insights on which to cling. The first is simply: we are in this together. When one of our number suffers, we all suffer. If we are to become a community of healthy individuals, we need to recognise and take seriously that healthy individuals are the fruit of a healthy community and a healthy community is one that sees each member as part of a greater whole. This is the genius that lies behind the foundation of the NHS, the insight that disease and other medical problems can fall upon any one of us at any time, and it makes for a saner society if we share the risk between us. The second is that grace arrives in surprising ways. When all things seem to be against us, when all our choices range from really bad to even worse, that is often the time when we can be most surprised by God. The world is not fixed to run along a particular course, and sometimes our hopes can be vindicated after all rational thought has told us to give up. Sometimes the suffering of a single person is enough to alert a healthy community that something much larger is going wrong. In just the same way that there is a ‘patient zero’ at the beginning of an epidemic, so too do individuals respond first to larger cultural changes. I believe that we cannot fully understand depression and related mental problems in isolation from the families and the communities within which the sufferers live and move and have their being. Ask not for whom the bell tolls. It tolls for thee. We live in a society where the open expression of anger is mostly frowned upon. I say mostly because there are some situations where our society seems to deliberately cultivate anger for the entertainment of others – I am thinking here of certain reality television programmes, where watching somebody have a meltdown on camera is considered a reliable way to get attention, and therefore higher ratings, and therefore a higher income. Such is the nature of our decadence. Yet should such behaviour be exhibited outside of the strange confines of a television studio it is seen as a sign of a disturbed mind, and in some situations strong words are highly likely to lead to trouble with the law. I believe that this is a problem. We need to rehabilitate the expression of anger in our society, and give it a proper place. I see this as ultimately a spiritual issue, in that the suppression of a healthy anger has caused a great many other maladies in our body politic, causing immense suffering to individuals and allowing for a great many abuses by the dominant powers to go unchecked. After all, anger is a constituent part of any animal, an element that enables them to live and function effectively within their environment. Without being able to call upon an angry response an animal is an easy target for predators or rivals. Imagine a stag trying to establish dominance within their territory, in order to mate – if another stag comes along and enters that territory without any response then the first stag will soon lose out in his love life and die off. No, anger is an essential part of a full and rich human life. 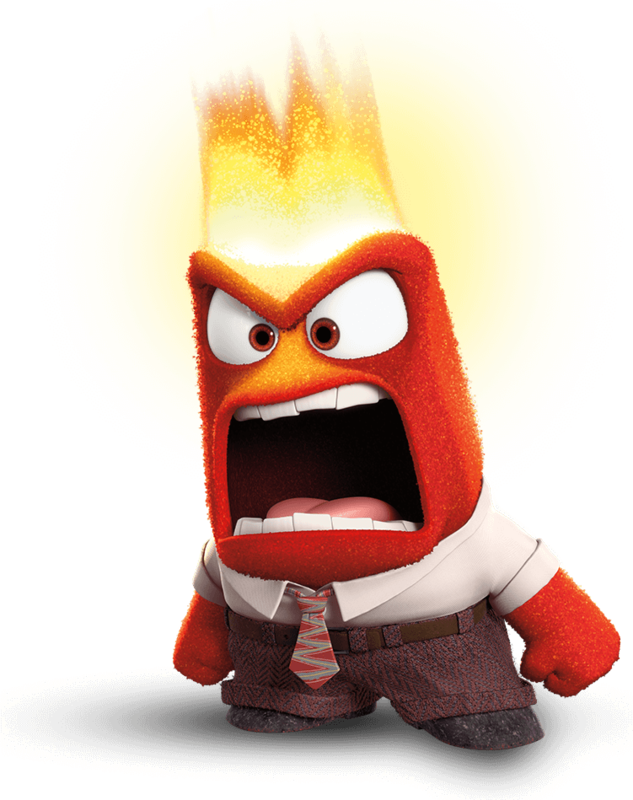 How can a Rector be arguing in favour of anger – isn’t anger a sin? Actually no, anger is not a sin. Jesus himself is recorded as being angry several times, most prominently when he drove the money traders out of the Temple. This was almost certainly the event which precipitated the authorities taking action against him, and which directly led to his crucifixion. What Jesus demonstrated throughout his life was something called righteous anger. This is the healthy response of a human being to a situation of injustice. For example, when Jesus sees the religious leaders being indifferent to human suffering he loses his temper with them and ‘goes off on one’, indulging in some quite colourful language to bring home to them how appalling their behaviour is. Most of us react the same way when we see someone being bullied or abused. One word of warning though – we’re not quite so mentally and spiritually healthy as Jesus. When we experience anger there is no guarantee that we are right to experience it. Sometimes we will experience the anger in response to an injustice that we can see outside of ourselves. Sometimes, however, we will become angry if we believe that we have been slighted, that we haven’t been given our due, that people are not offering us sufficient respect. In other words, the injustice will be bound up with our pride. This can be an unbelievably toxic combination. How can we discern the difference? Only by prayer. Prayer is often caricatured as begging for the unlikely from the improbable but that misses the heart of the matter. Prayer comes in different forms, and one of the key ways to pray involves giving something our full attention. That is, if we pay attention to something (or someone) then we allow it to be itself; in other words, the process of prayer is the process of seeking to eliminate our own distortions and biases, our own projections and neuroses, in order that the full truth of that something (or someone) can emerge. This is what needs to happen with our anger. Not that we need to pray before we allow ourselves to become angry but rather that, if we find ourselves becoming angry on a regular basis, we need to ask ourselves some hard questions. Is this anger truly being driven by an injustice out in the world (and if it is, to what use shall I put this angry energy that God has given me)? Or, is this anger simply born from a misplaced sense of pride, and is this angry energy being given to me so that I am motivated to do the hard spiritual work of examining my assumptions and sense of myself, in order that I can then see the world more truly? When Jesus said that some demons can only be driven out by prayer, I believe that this was what he had in mind. There is a sin – one of the worst, called ‘mortal’ sins – that is related to anger, but which needs to be carefully distinguished, and that sin is called wrath. Anger is an immediate response to a particular situation, an emotion that can quickly blow over, and which certainly doesn’t need to be eliminated from our relationships. Wrath, however, is not an immediate emotional response, rather it is a settled disposition of the will. We have to decide to be wrathful. Wrath occurs when someone is determined to bear ill-will towards somebody else, thus refusing all human contact with them, or making such human contact as occurs devoid of human feeling and warmth. It is a refusal of forgiveness and a rejection of grace. Instead of the volcanic explosion of anger, wrath is the ice field, a glacier cutting off human life. It is, in short, a refusal of relationship – and that is a very useful definition of sin as such. To succumb to wrath is to place our own souls in mortal danger, and the consequence is that the wrathful person becomes sick in mind and often body. The bible is filled with rich examples of righteous anger directed at those in positions of power and authority who use their status to abuse the weak and vulnerable. Jesus says: “Woe to you, scribes and Pharisees, hypocrites! For you are like whitewashed tombs, which outwardly appear beautiful, but within are full of dead people’s bones and all uncleanness. So you also outwardly appear righteous to others, but within you are full of hypocrisy and lawlessness!” If we imagine Jesus saying this in a perfectly placid and calm tone of voice then we are suffering from a failure of the imagination. No, Jesus was angry and expressing his anger forthrightly. We would benefit from a bit more of such anger today. The Daily Telegraph has a story about a church in London which has been hosting an Islamic prayer service. There are more details here, presumably written by the person who shot the video. First point: do not believe everything that you read (or see or hear!) in the newspapers (I speak with authority). That being said, unless the video is demonstrated to be a forgery, I think this is a serious breach of ordination vows – specifically the declaration made at ordination and then repeated at each new appointment that “in public prayer and administration of the sacraments, I will use only the forms of service which are authorized or allowed by Canon”. I believe that there are other elements of Canon Law that are relevant. I believe that our words matter, and when ‘Allahu Akhbar’ is chanted in a church, then this is a quite straightforward example of blasphemy – it is a profaning of Christian worship – and sacrilege – a profaning of the place of Christian worship. To argue otherwise is to indulge in syncretistic nonsense of the worst sort. The different faiths, whilst they have all sorts of family resemblances, are not simply different paths up the same mountain. It matters that Jesus was crucified, and to preach Christ crucified is to say that Jesus was killed, which the Koran explicitly denies. I can see all sorts of arguments for pursuing peace, hospitality and friendly co-operation with those of non-Christian faiths and no faith at all. What I cannot see an argument for is abandoning our own distinctive identity, with all that binds it together. I am more and more persuaded that the problems that we face in the Church of England stem from a collapse of faith. We no longer believe in God, we no longer know what we do believe in, and so we chase desperately after idols, hoping that one or other of them can fill the gap. This will never happen. Between the idol and the Living God is an incommensurable distance. Which idols am I thinking of? Here are some. The idol of public acceptability, leading the Church to marry the spirit of the age, leading to inevitable widowhood. The idol of ‘family’ as if the worth of the church can be measured by how far it can compete with Go Bananas. The idol of intellectual respectability, as if conformity to Modernist rationalism is the acme of faith. The idol of Herbertism, as if priesthood could be reduced to the niceness of middle class mores. The idol of bureaucratic managerialism, as if ministry can be reduced to the manipulation of numbers and financial returns. Let us not be naive. The worship of idols requires sacrifice – not the sacrifice of thanksgiving but the sacrifice of human flesh: burnt out pastors, spiritually impoverished congregations, human misery in myriad forms. Idol worship makes the church sick, and the sickness then infects the wider body of society. We no longer know what we are here for. The old has definitely passed, and because we worshipped a particular cultural role, and enjoyed the importance that flowed from it, we didn’t notice when God left the building. We are reduced to more and more frantic efforts to rekindle flames but the world can see the difference between orange paper and that which burns. The Living God is taking away all the things which we valued, in order that we might concentrate once again upon the one thing needful. This is an act of love, and it is only painful in so far as we fight it. We need to let go – of all of it. All our inherited expectations of what church looks like, of what ministry looks like, of what worship looks like, of what Scripture and teaching looks like. We need to go out into the desert without looking behind at Egypt and Babylon. We need to trust much more joyously in the provision of the Living God. We need to have our hearts broken open, so that the rocks might be replaced with flesh. Woe to us. Woe to us. Come let us return to the Lord, for he has torn us and will heal us. I just think we need more tearing before we are ready for the healing. Prayer seems often to be understood as an auditory dialogue. That is, in our minds we forms words and sentences – even paragraphs! – that we then address to God; then, in turn, God responds in the same way. Whilst I wouldn’t for one moment want to say that this does not happen, I would want to say that this has never been my experience of prayer. Although I am someone who has occasionally had ‘visions’ I do not experience God ‘speaking’ to me in the form of explicit words. So why am I comfortable with the language of God speaking to people? Of God directing them, of God answering prayers? I have found two forms of prayer to be satisfying, and when I talk about prayer, this is what I am referring to. (Those who know their Augustine will recognise the shape of what I am describing). The first is what comes when I start the process of ’emptying’ my own mind and awareness in order to let God speak into it. That can often happen through liturgy and ritual, eg Morning Prayer, but it can also happen just as reliably out of stillness and peace. As the general noise of my own internal monologue quietens down, other thoughts, images and ideas come forward. Some of these have a particular character, a ‘glow’ about them, a ‘smell of something good’ (those are metaphors). I have found that if I dwell with those particular thoughts, they lead me to a place of spiritual growth. I learn more about myself. I learn more about what I am called to do with my life. I find that I become a better person from paying attention to such things. This I experience as the principal means by which God ‘speaks’ to me – it is not about specific words, it is more about recognising a particular pattern of compulsion. Sometimes this compulsion can be utterly overwhelming (and thus: terrifying) but I hope – pray – that such things have passed, and that I can pay more attention to God’s promptings before He has to resort to extreme measures. The second way relates to being in nature, especially when I am on the beach or, more rarely, when I am in a forest or – best of all – if I am sailing. What happens in these cases is less direct than the introspection that I described above, but is more clearly a form of ecstasy, ie ex – stasis, a ‘taking out of myself’. When I lose myself in the natural world, when my internal monologue is quietened, I often experience two things – one, the sense of ‘divine presence’ and comfort about which our religious tradition so often speaks, a sense of ‘being-at-home-in-the-world-ness’ (surely there is a German word that means exactly that? ); second, sometimes there will be a particular idea or thought that leaps as if fully formed into my consciousness, provoking an ‘oh, of course’. Again, there is a particular character to these things, which makes me recognise them as being ‘of God’. A sceptic atheist might object – this is just a question of accessing your unconscious! Why bring God into it? I reject the redescription, not because I see it as false, but because I see it an incomplete, and as cutting off the insight that is possible from integrating our own experience with the experience expressed through a tradition that is thousands of years old and which has vastly more wisdom embedded in it than contemporary secularism could ever dream of. So that is prayer, for me – an introspection and an ecstasy. I enjoy horror films. This is a somewhat bizarre taste for a clergyman I suppose (a legacy of a very secular youth) but I find them cathartic. After all, classic horror is deeply conservative – there is a peaceful status quo; there is a violent interruption to the status quo; then the violent interruption is repudiated. My taste tends more to the supernatural thriller side of things (The Exorcist, The Conjuring) rather than the gory schlock (Friday 13th) but I can enjoy most of them – particularly if I find myself in need of an emotional purging. Sometimes I can get really tense and a good ‘Aaaagh’ is effective therapy. Why am I discussing such things here? Well the interesting thing about that film isn’t the gore but the exploration of the nature of choice, specifically, of the way in which we prioritise certain things rather than others. It is a measure of our humanity that we are able to step away from our own immediate needs and see a larger picture. The film is an exploration of values and it operates very effectively as a critique of the collapse of conventional western values and their replacement by mindless and selfish consumerism. Each character is faced with a particular choice, rooted in their previous patterns of life, and the challenge for each of them is to ‘choose life’. There is a strand of theology rooted in some passages of the Old Testament which relates quite strongly to this. Specifically, in Deuteronomy chapter 30 God gives the Ancient Hebrews a choice. Either they choose life, which means to worship YHWH and establish social justice, and they shall flourish; or, they choose death, which means worshipping foreign gods and tolerating injustice, and then they shall be destroyed. This fundamental message is repeatedly forgotten in Old Testament times, and in order to bring the people back to the right path, God sends prophets to them on a regular basis, to repeat the ‘Word of God’ and call the people back to life. Prophecy is often misunderstood as being principally about a prediction of the future. Such predictions are a part of what the prophetic ministry means, but they are a byproduct of the primary task. Jesus himself, as the quintessential prophet, sums up the prophetic message when he describes the two great commandments. The first is to love God with all that we’ve got, to put him first in our priorities; the second is to love our neighbours as ourselves, which means to establish social justice, to ensure that no member of our society is flung onto the garbage heap. Where such priorities are not in place, the consequences are terrible. When the prophet denounces such activity he usually follows the denunciation with a vivid description of what the consequences will be, using the language of God’s wrath. These consequences are principally geo-political. The political leadership of a country that has turned away from the right priorities is – by definition – operating in an unreal situation. This means that their decisions become less and less guided by truth, and more and more guided by the illusions held by the ruling class. The most vivid example of this in Old Testament times came with the destruction of Jerusalem by the Babylonian army in 586 BC. The ruling class had felt themselves immune to the consequences of their actions; the prophet Jeremiah denounced their foolishness (and was thrown into a cistern for his troubles); the false prophet Hananiah told the rulers that everything was going to be fine – but reality broke in and scenes from a horror movie ensued, culminating with the slaughter of the royal family on the steps of the temple. It is a useful rule of thumb when considering the nature of God to substitute in the word ‘reality’ – instead of saying ‘God won’t like that’, say instead ‘reality won’t like that’, in other words, ‘it won’t work, it will go wrong’. To be properly attuned to God in any situation is essentially to see the underlying truth clearly, to not allow any distortions of value to mislead our judgements, to step away from illusion. This is essentially what the prophet does – he simply speaks the truth into a situation. Sometimes this truth is heard by the leadership of a community – as with Jonah in Nineveh – and the people repent, and the foretold disaster is averted. Where the truth is not heard, however, then the consequences are terrifying. We are, I believe, in a time when the consequences of our prior actions and decisions are coming back to haunt us. Western society does not have right priorities, and it is not concerned to seek social justice, and as a consequence we are running head long into the brick wall of reality. We have built an empire upon cheap energy and easy credit, and now both of those things are being taken away. We are going to have to start making choices about what we really want – what are we prepared to let go of, what are our deepest values? Where those values are aligned with God and social justice, then we still have a potentially prosperous future ahead of us, even if it means we have to saw off things that we are remarkably attached to. If, however, we refuse to make such choices, then a bloody fate lies in wait.